I'll be away from Durham and the blog the first part of March due to a long-scheduled vacation to London. But that's not to say there won't be anything new here at BCR. In fact, I'm very pleased to announce that five guest bloggers will be contributing occasional stories here over the next week and a half. Look for their posts below this announcement, and click beyond the cut to find more about our guest contributors. A big thanks to them for keeping this place running while I'm gone. See y'all in a few days. Thursday was a big day in the local newsin' business. Life around Chez BCR is a bit crazy right now getting ready for a big excursion tomorrow -- more on that shortly -- and I wasn't able to make either the school board meeting or Greenfire open house last night due to the Durham Neighborhood College program. Creekside: The school board voted unanimously last night to defer any immediate decision on redistricting until a full study by NC State demographers can be completed. Instead, it's trailers for Creekside next year, with permanent new-classroom relief coming the following year at the soonest. Expect redistricting talk to come up again, though, after the NC State group completes their analysis. I sympathize with the parents who are frustrated at Creekside's rapid devolution from brand-new school (opened, ironically, to provide relief for crowding at Parkwood, Southwest and Forest View) to being crowded itself. On the flip side, there are always growing pains that come with moving to a newly-established part of town like South Durham. If you live in a brand-new subdivision south of I-40 surrounded by forest -- especially a subdivision with lots of impervious surface, few tree stands, etc. -- one should not be shocked to see other such neighborhoods sprout up nearby. Could Durham officials have planned the growth of South Durham better? Absolutely. But find me another municipality in North Carolina, or the Sunbelt for that matter, that does any better at this. Speaking of Gregson St., it's been almost exactly a year since the N.C. Board of Transportation voted to partially fund neckdown devices on Duke and Gregson St. as a method to hopefully slow down through-traffic to speeds better resembling, you know, the posted speed limit. While that deal with the state was underway, however, the City installed neckdowns on Anderson St. south of the Duke campus. And, boy, did those neckdowns create a hubbub around the Bull City. Bicyclists protested those neckdowns, which were implemented on a popular (and signed) bike route, and which made life much more hectic for the two-wheeled kind of commuter. At the same time, the City's evaluation of these neckdowns -- which was the technique's first implementation in Durham -- showed a very small impact: an average speed reduction of only about 1 mph. All of which brings us -- if not quite back to stage one -- at least to stage one-and-a-half. Heads-up to downtown commuters: Avoid Gregson St. this morning if at all possible. A tractor-trailer appears to have wedged underneath the railroad bridge at Peabody & Gregson. All traffic is being routed off the street at Main. Which is fine as of 7:15 am, but won't look so good in an hour's time, shall we say. Expect Gregson to clog up as far back as Trinity at the least, and Main St. to be a mess, too. Ironically, I discovered this upon arriving at Alivia's for a quick morning breakfast & blogging session -- the latter of which focuses on Duke/Gregson traffic calming. More on that in a bit. DPAC naming rights: Teers in; whither Capitol/BCBS? Good news for the Durham Performing Arts Center project: The City announced in a press release today (which was promptly picked up by the N&O and WRAL, among perhaps others) that the Teer family, a longtime presence in the Durham community, has picked up naming rights for the center's stage. Pending City Council approval at its March 3 meeting, the $1.2 million contribution over 10 years for the stage naming rights is a first for the new center. "This is milestone for Durham as we have our first naming rights at the Durham Performing Arts Center associated with one of our best known Durham families,” Mayor William V. “Bill” Bell said. “The Teers have done so much to help Durham develop as a quality city and have given back to the community through their extensive civic service over the years. The generous financial commitment and the name association truly enhance our newest destination venue in downtown Durham." The quote attributed to Bill Bell is correct -- the Teer naming is, in fact the first naming rights for the DPAC that are associated with a prominent Durham family. But they aren't the first naming rights for the DPAC by a long shot. Capitol Broadcasting has a 13-to-20-year deal on the outside plaza, while Blue Cross/Blue Shield of NC purchased the atrium lobby naming rights, according to this 2007 City press release. Now, that's not in conflict with the press release, which if read literally, is correct; these are just the first for a family naming. But a casual read could give the impression that they're the first naming rights, period. Ah well, small matter. Heck, even Capitol Broadcasting's own WRAL ran with the quote as it stands without any clarification. So maybe I was the only one who was confused by this? Eric Ferreri over at the N&O has a very good story about the NCCU master plan in today's edition, including the news that recently-installed chancellor Charlie Nelms will not be bringing the plan before the school's board of trustees for a vote today as initially scheduled. The plan calls for the purchase and re-use or demolition of a staggering 136 homes adjacent to the campus to support Central's campus expansion. 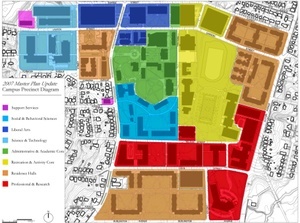 The biggest chunk of properties to be purchased would be several blocks on the southern side of the campus, just to the west of the new school of education facility and east of Fayetteville St. The plan would also bring Central's campus north towards Dupree St.
An enlarged nursing building (intended to support a full professional school in the growing discipline), new residence halls and a library, and an enlarged football stadium are central to the proposal. The big driver for the campus growth is, well, growth -- NCCU has grown from 6,000 full-time equivalent students in '02 to 8,300 this fall, and the General Assembly set a new target last year of 11,745 in the next ten years. The doubling of NCCU's size is a massive change for the campus as well as the surrounding neighborhood, and one that hasn't come without controversy. Thursday's going to be a big day for the new Durham Performing Arts Center, as facility operators Nederlander and PFM will unveil the inaugural schedule for the new arts facility in the revitalizing American Tobacco district during the Greater Durham Chamber of Commerce's annual luncheon. No early word on what to expect -- but given the pedigree of the operating team, I'd be shocked if it wasn't a set that'd make folks take notice. One early line we can report: construction on the DPAC is going well, with the contractor still projecting an on-time, on-budget completion; expect the first shows to fall late in the calendar year. Thanks to Bob Klaus, the recently-named general manager of the facility, we got a sneak peek at the construction progress last week, providing a great preview of what's to come for what will be, at its opening, the largest performing arts center of its kind between Atlanta and the megalopolis. 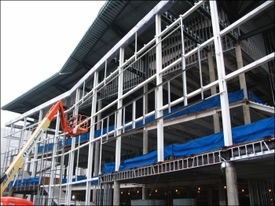 In fact, if you're growing accustomed to the open steel front of the building -- take your last pictures soon. 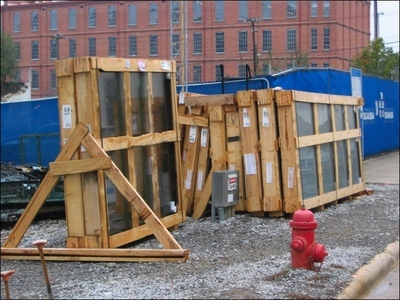 The glass windows have arrived, and will start going on the building in the coming weeks; a mix of clear and tinted glass will be visible on the building's north-facing facade. Greenfire Development and the City's Office of Economic and Workforce Development are holding an open house to take questions from the public on the developer's proposed downtown development plan and the accompanying public-sector incentives/partnership plan. That plan will go before the City Council the evening of Monday, March 3, according to the latest information we have. Expect to see a large number of questions coming Thursday night from downtown residents and small business/property owners, some of whom say they had no inkling of the size and scale of the properties that would be built adjacent to or across the street from their homes and parcels. Which is, in and of itself, another asterisk of interest surrounding Greenfire's approach to the project. After all, appeasing (or at least consulting) your neighbors before proposing new construction is pretty much a given for large local projects. On the one hand, there's a risk in this strategy for Greenfire -- getting through the incentives process, only to get slammed in the entitlement process on the various individual projects, wouldn't exactly be a desirable outcome. On the flip side, would a City Council once-invested in incentives ease up on the brakes when it comes to later project review and approvals? All of which leaves small downtown stakeholders -- not to mention the well-organized DAP stakeholders -- looking towards this open house, and especially towards Monday night's Council discussion of this item, with a great deal of interest. Sad news for Durham's arts scene: Leonora Coleman, the founder and owner of Claymakers on Foster St., lost her battle with illness this week and passed away on Friday. A memorial service will be held on Thursday Feb. 28 at 4pm at St. Luke's Episcopal Church on Hillandale Rd. Claymakers has been a fixture in the arts renaissance in downtown Durham in general and in the DAP district in particular, offering a retail store, gallery, studio space and instructional classes in the art of working with clay for several years. Coleman announced earlier this year that the business was for sale due to her ill health; the $60,000 sales price quoted for the business included the right to assume a three-year lease on the building, customer records, and the existing management team's services. The center's co-managers, Tanya Schreiber and Analia Howard, announced in an email this weekend that Claymakers will remain open through the end of the current class schedule on April 20, but the picture is dim thereafter if a new owner isn't found. Visit the Claymakers web site or email the management team for more information. Drought update: Bigger Wake stake or a second lake intake? Both the N&O and the Herald-Sun have good coverage of the drought and water supply discussion that took place at last week's Council work session; hat tip to Ray Gronberg for highlighting Carrboro mayor Mark Chilton's opposition to any new intake until and unless Durham adopts a policy on growth that mirrors that in his town and Chapel Hill. Actually, that'd make a good new verse for the insanely catchy and, well, just insane "It's Carrboro" theme song: "We got a mayor in Chilton / Who likes to slow growth down / And if you don't like it / No flow for your town! (Everybody: It's Carrboro, it's Carrboro!)" Anyway, back to planet Durham. (No less crazy, just differently crazy.) It's good to see the City aggressively pursuing a second connection to Jordan Lake or the alternative scheme, which could involve Durham helping to fund an expansion of Cary's water treatment plant to help it draw more than the current 40 million gallons per day of water maximum -- the towns alloted draws from Jordan Lake are allowed to claim 100 million gallons per day, but there's no intake or treatment capacity to do so. Deputy city manager (and now head-honcho candidate) Ted Voorhees noted in Thursday's work session that it wouldn't make sense for Durham to invest in a second intake unless the city received an increased allocation from Jordan Lake beyond the current 10 MGD in an upcoming round of state environmental review. At the current draw levels, Voorhees noted that the alternative -- making a long-term investment in Cary's infrastructure to allow for an economical draw of Durham's entitlement through that town's system -- is more cost-effective.